It took D’angelo 14 years of silence, between “Voodoo” released 2000 and his latest release “Black Messiah”, rush releases in December 2014, actually it almost passed us by. The album was rush released without any huge PR campaign, no big boards, no social media leaks. It´s just here in yer face, right here – right now – and it´s a helluva great comeback – a classic album from day one! It´s the first to be credited to D’angelo And The Vanguards. His new band, and what a band! “Black Messiah” sounds like a continuation of “Voodoo” taken 14 years into the future, without loosing it’s inspiration from the big ones from the past. 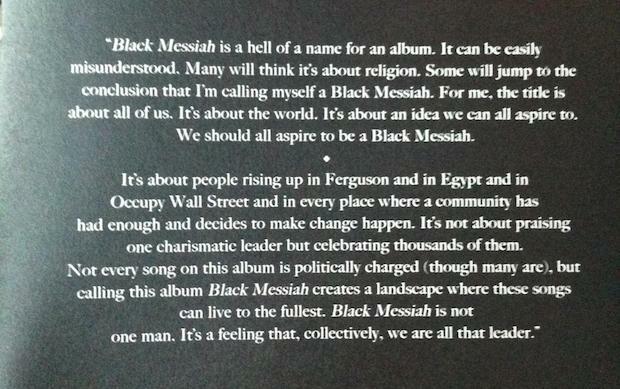 “Black Messiah” shows the path into the future of nu-neo-soul. This is DEEP SOUL! As earlier releases by D’angelo the shadow of Prince is found all over the album, but on the “Black Messiah” album we also get a large slice of George Clintons psyched out space funk. Guitars ripped off Ernie Isley of the Isley Brothers and Eddie Hazel, even Jimi Hendrix here and there. The funk of Sly Stone, the political soul of Marvin Gaye and the political lyrics and falsetto of Curtis Mayfield. And we’re not forgetting Prince, because this album has also a track, just like “Voodoo”, that is more Prince than Prince has been the last years. «Another Life» is this years «Untitled (How Does It Feel)» both tracks is some of the best tracks Prince has never written, the track you have to double-check the liner notes twice a day! D’angelos third album is embracing a huge handful of genres but is without doubt a soul album that’s instant funky, dry like the deserts of Sahara and sweat like a long hot summers night at the same time, groovy as hell, smooth like butter, juicy jazzy, latin and sitar flirting rock and gospel bomb; Sometimes all at the same time! 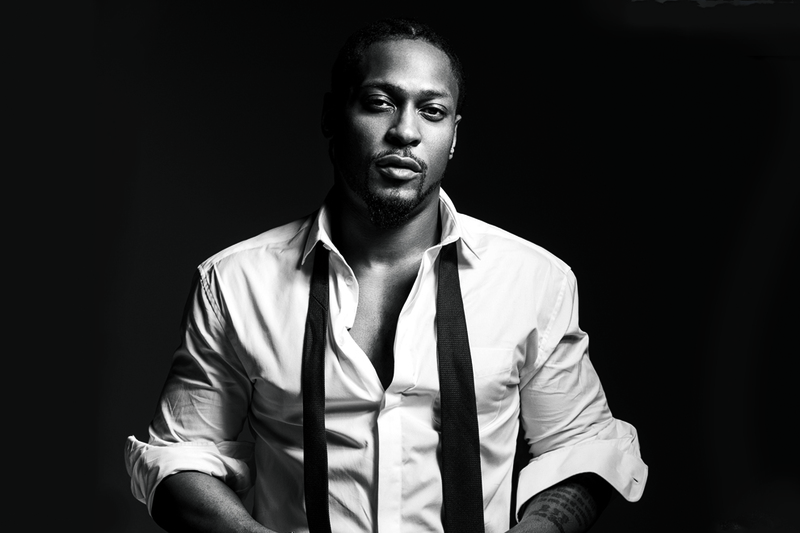 D’Angelo has had some tough years, his much written a about weight problem, his problem with coping with his own success and his almost fatal car crash while on drugs, that almost killed him! Musically Frank Ocean has almost been there on the fantastsit “Orange”, Beyonce has dipped her toes in the same eksperimental water with her self titled latest album, Miguel almost made it, Prince and his 3rd Eye Girl has tried, and revitalised the sound of Prince! But It’s cool to see how D’angelo collects all the loose threads from the aforementioned to create his third album. With “Black Messiah” does D’andelog dare to show his music colleagues how real soul should be done in 2014. The album and sound of “Black Messiah” will be a blueprint for how soul should sound in the future, without loosing it’s roots in the past! The albums mighty production sounds 50% improvised and 50% produced. Everything sounds right. 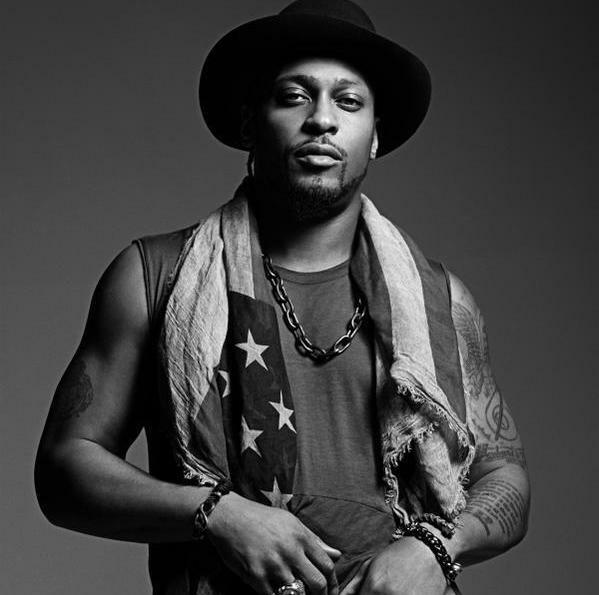 It’s a living proof that there is still place for the sound of D’angelo in a world were we questions the future of the album – and physical formats. This is album music, as album music should be released and listened to – at a whole, as a story, as a part of history – from first track – untill the finnished last track! With their deep soul album «Black Messisah» shows D’angelo And The Vanguards that they live up to the album’s title as a saviour of soul music and that the long wait was worth it! All of a sudden 14 years didn´t sound so long time ago. What perfect way to end the year! LISTEN TO “BLACK MESSIAH” ON SPOTIFY – OR DOWNLOAD IT ON ITUNES HERE!